Free VM backup for 2 VMs per host, forever – our way of assisting micro businesses. Looking for a freeware backup solution for Microsoft Hyper-V and/or VMware? Altaro VM Backup – Free Edition is an award-winning backup software solution for virtual machines (VMs) that is easy to use. It gives you all you need to enjoy VM backup solution basics for free, forever. If you are looking for the full paid edition, with far greater functionality, click here! Our software was built to make backing up your VMs super easy, whether you use Hyper-V, VMware or both. We take care of the complexities to help save you time and hassle. Altaro VM Backup has a proven track record and does what it promises. For Hyper-V users, Windows Backup and PS scripting only gets you so far and doesn't give you much confidence. If your requirements grow, a paid license is fairly priced. A paid license of Altaro VM Backup starts at just $595 per host (not per socket, CPU or VM) and includes one year of our Lightning-Fast Call Response Guarantee of under 30 seconds, and maintenance (SMA) Educational and NGO discounts are offered on new licenses. Our 40,000+ business customers worldwide are delighted with our software and trust us to have their back when it comes to data protection. Click here to see for yourself what they think of Altaro VM backup! 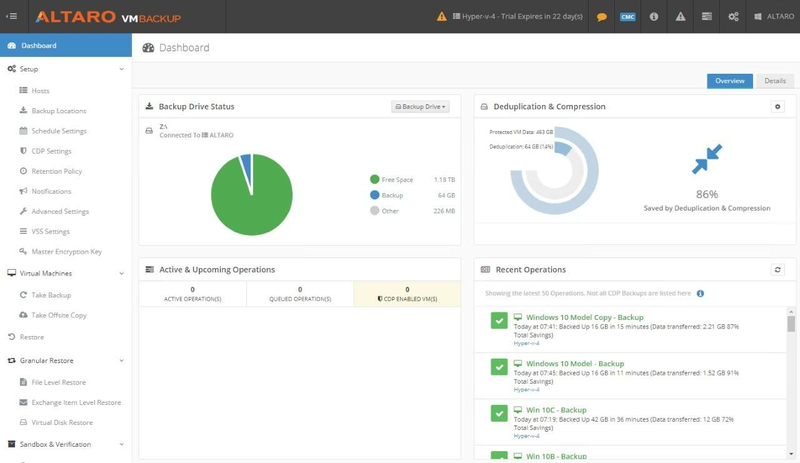 What are the benefits of Altaro's free VMware and Hyper-V Backup solution? Back up live VMs easily without having to stop them. Make hot backups at the click of a button. Altaro's VM Backup freeware is optimized for fast backups and restores. Save on disk space and boost performance by using advanced compression on your VMware and Hyper-V VM backups. Restores are optimized by OnePass Restore, to get you out of trouble in no time. 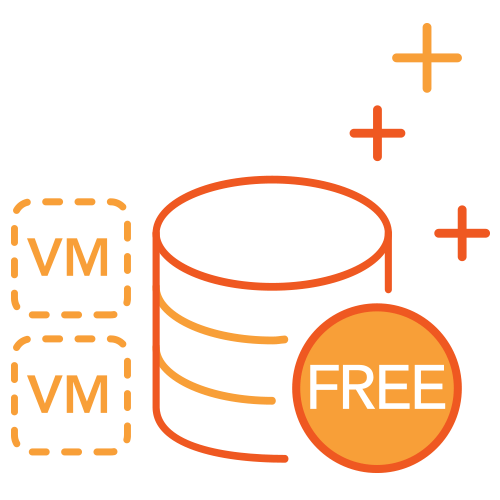 This free Hyper-V backup and free VMware backup software enables you to back up your SQL and Exchange VMs (and any other applications compatible with Microsoft's Hyper-V VSS Writer). You can also back up Linux VMs. Automating your Hyper-V and VMware VM backups has never been easier. 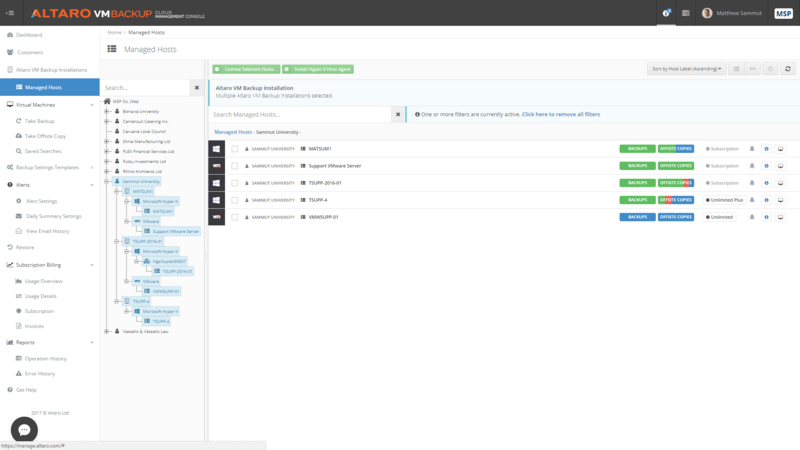 Create a flexible backup schedule for all your VMs. 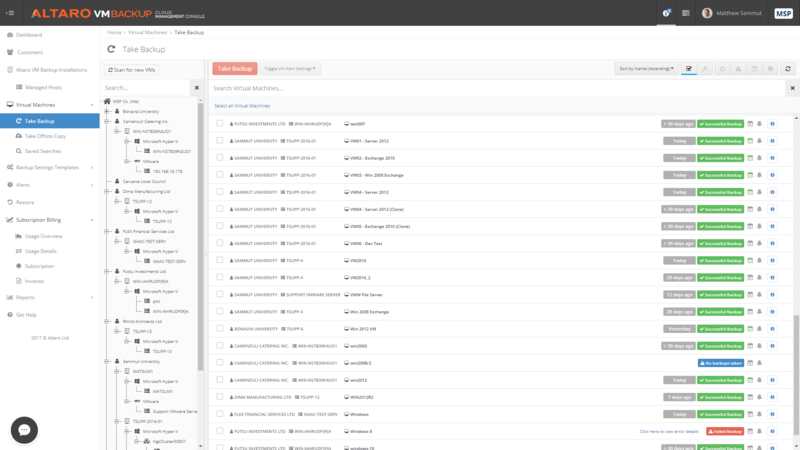 Simply drag and drop VMs into specific schedules, save and you're set. Need to work on a live VM without affecting its performance, interrupting its users or overwriting anything? Just create a clone and rename it for quick access and preparation of your live VM replacement. 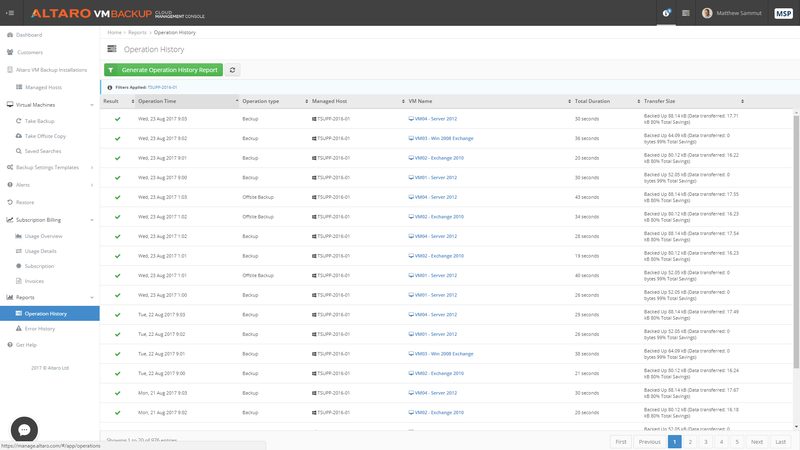 You can run Altaro VM Backup - Free Edition on Unlimited hosts, protecting up to 2 VMs for each. No Strings attached - no obligations whatsoever. What backup media does Altaro VM Backup – Free Edition support? Seeking enterprise-level VM Backup functionality? Upgrade to one of our paid editions today and enjoy features like WAN-Optimized Replication, Continuous Data Protection, Augmented Inline Deduplication, Cloud Backup to Microsoft Azure, Multi-Tenant Management and much more! 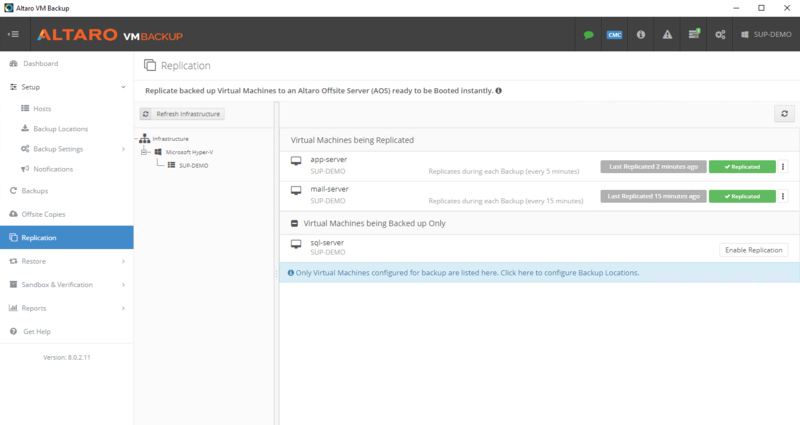 Altaro VM Backup's WAN-Optimized Replication functionality enables you to be backup and running in minimal time should disaster strike: All you need to do is to switch to a replicated virtual machine (VM) that is running offsite. WAN-Optimized Replication is a key component of any Disaster Recovery plan. It permits a user to make an ongoing copy of the organization's virtual machines (VMs) to remote site and to transfer to that copy right away should anything go wrong with he live VMs, such as damage due to hurricanes, fire and flooding. This significantly reduces the RTO, that is, the recovery time objective or the maximum duration of time that VMs and applications running on them can be down after a failure occurs. Using a continuous data protection model rather than a simply replying on daily backups results in a vastly improved Recovery Point Object (RPO). 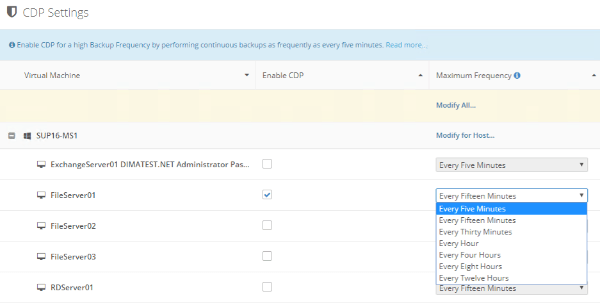 When CDP is enabled in Altaro VM backup, you can backup selected VMs as frequently as every 5 minutes or the maximum frequecy permitted by the backup location and environment. This ensures that only a few minutes of data are lost in a data loss scenario. RPO is the point in time to which VMs are restored by a backup solution in case of a disaster. With CDP in place, users' RPO is optimized to up to 5 minutes, as compared to hours of data loss that arise when users are simply running daily backups. Altaro's Augmented Inline Deduplication dramatically reduces storage requirements for your backup repository. It creates the smallest backup size beats other vendors to provide the best Deduplication in the industry. And as more VM backups are added, the greater your savings on storage requirements. 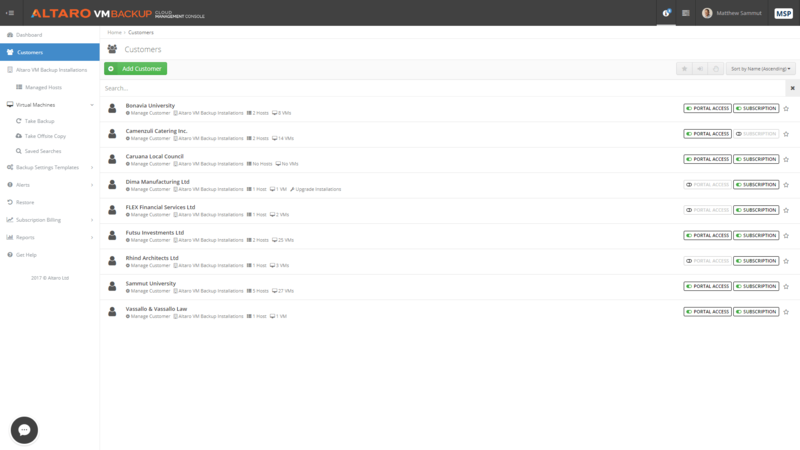 Altaro's Deduplication runs across all backup jobs, meaning that you don'y need to group virtual machines together; and there's no post processing. Using Augmented Inline Deduplication means you need the least amount of backup space - and it also improves backup and restore speed, as there's less data to transfer. This, in turn, does not tax server performance. Altaro combines Deduplication with the use of Variable Block Size to achieve greater efficiency. Altaro VM Backup facilitates backing up by supporting Microsoft Azure Cloud Storage Accounts. This means that all you have to do is enter their account details to have your offsite copies stored in Azure. This way, you can easily make a backup copy of your data direct to Azure, as well as to a local disk, network path or an Altaro Offsite Server. 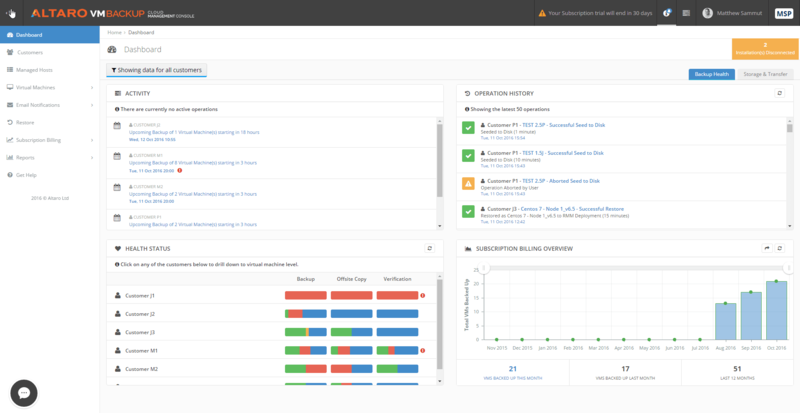 Altaro VM Backup includes access to a ground-breaking web-based, multi-tenant management tool that enables IT departments, end users, IT Resellers and MSPs to manage and monitor all their Altaro installations from a single pane of glass. 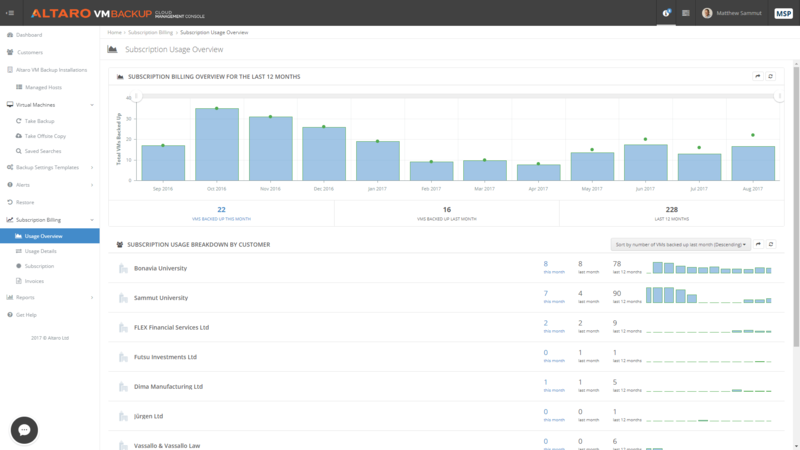 Multi-tenancy - You can manage and monitor multiple hosts and customers (if you're an IT Reseller/MSP) or sites (for orginizations with multiple locations). 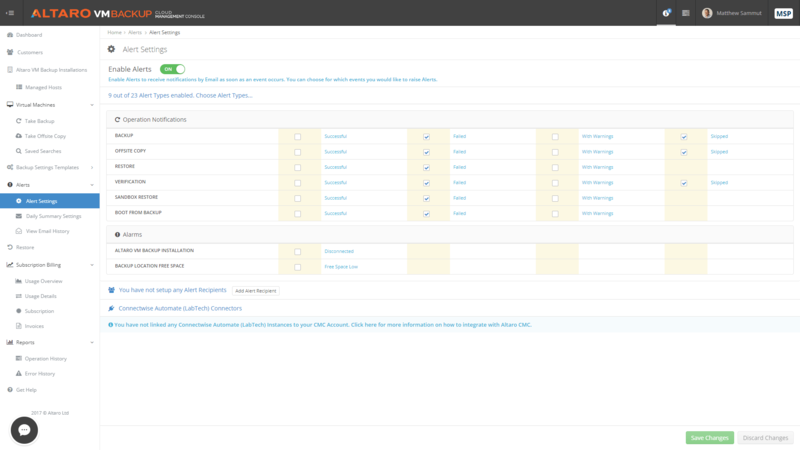 Manage your backups/restores - Start backups, configure backup locations, offsite locations for backup storage or replication, and restore VMs directly from the online portal. Real-time status updates & alerts - View live operational activity and backup results in real time, and set instant email alerts. Free for 2 VMs forever. Get started in a few minutes. What operating systems (OS) does Altaro's freeware VM backup support?